In order to reduce pain, prevent injuries and enhance performance you need to have neuromuscular efficiency. 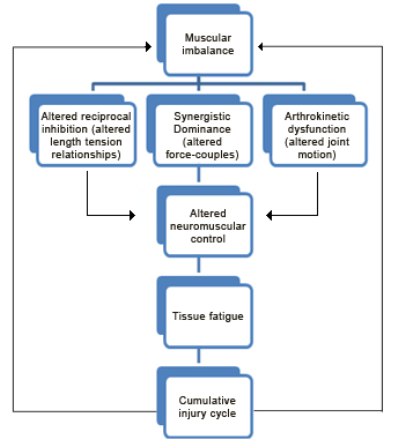 Neuromuscular efficiency is the ability of the neuromuscular system to allow agonists, antagonists, synergists, and stabilizers to work synergistically to produce, reduce, and dynamically stabilize movement within the kinetic chain in all three planes of motion. In other words, the length and tension of muscles surrounding the major joints in your body are balanced, the joints are aligned and moving optimally and the nervous system is able to coordinate movements efficiently and without compensations. Most of us do not have optimal neuromuscular efficiency. Is there a test that can identify these imbalances (neuromuscular efficiency)? What can you do once the imbalances are identified? The testing takes about 15 minutes and can accurately pinpoint the areas of dysfunction within the kinetic chain that need to be addressed. i.e. muscles to be inhibited and lengthened, muscles that need to be strengthened and exercises that can be used to groove new motor/movement patterns. *This is an evidence-based assessment and treatment model that has been used by professional sports teams to manage and prevent injuries. Interested in learning more? Come to OPTIMA 2016 or e-mail me.